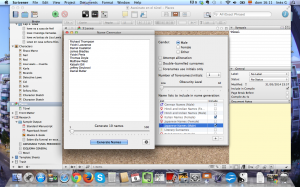 About a month ago, I decided to give Scrivener a try and use it to write my next novel. I must say I am completely amazed. Not only you can better organize your novel, it gives you a whole new writing experience. No, I am not getting paid for reviewing this software, I truly think it’s a great tool that makes the writer’s life easier. 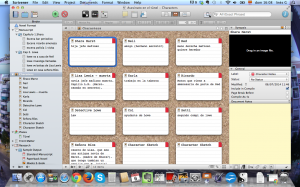 It allows you to organize your chapters, set a word target and check which chapters or scenes are ready. You don’t need to scroll up your document to read a scene, you can easily click on it. It also allows you to create character cards with their personalities and descriptions so you don’t forget when that character appears again many pages later. That applies also to places and other data you need to check again later. It even has a name creator with names in different languages that can give you ideas. It has many other useful utilities like novel templates, a back up system and compilation system in different formats like .doc or .pdf that I am discovering little by little. For now, I haven’t seen anything that I don’t like. I have written 2 chapters for my new novel. I am participating at Nanowrimo Camp. 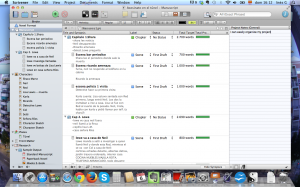 I have been using Scrivener, and I totally recommend it. If you would like to receive more posts like this one in your Inbox, sign up for the newsletter on the column on the right!